Here we are in remote north Norfolk, in an intensely rural parish not far from the Raynham estate. And yet, on first seeing this church set on a mound above the village street, I was reminded of the suburban churches of the south coast I knew when I lived in Brighton. 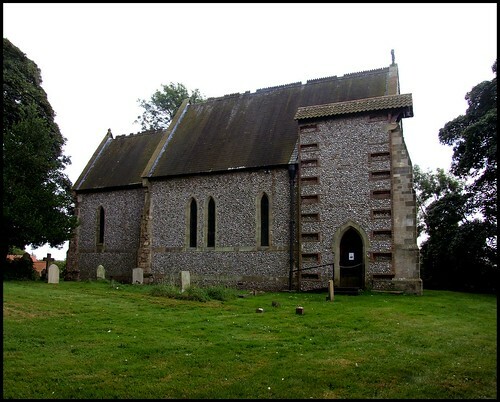 St Margaret was built by William Lightly in 1862 as a chapel of ease to All Saints at Tattersett across the fields, which is probably the most remote of all Norfolk's parish churches. The chancel is tall and narrow, like a sentinel above the steep path, which rather curiously has had astroturf laid up it, presumably to prevent further erosion. You climb the path towards a great crucifix, as if this was a Catholic church rather than an Anglican one, and as you come out into the open space to the north of the church you see for the first time quite how unusual this building is. The windows are narrow lancets, creating a fortress-like effect. The north doorway is set in a kind of pseudo-porch, surmounted by a narrow ridged roof, as if something taller had been intended once. 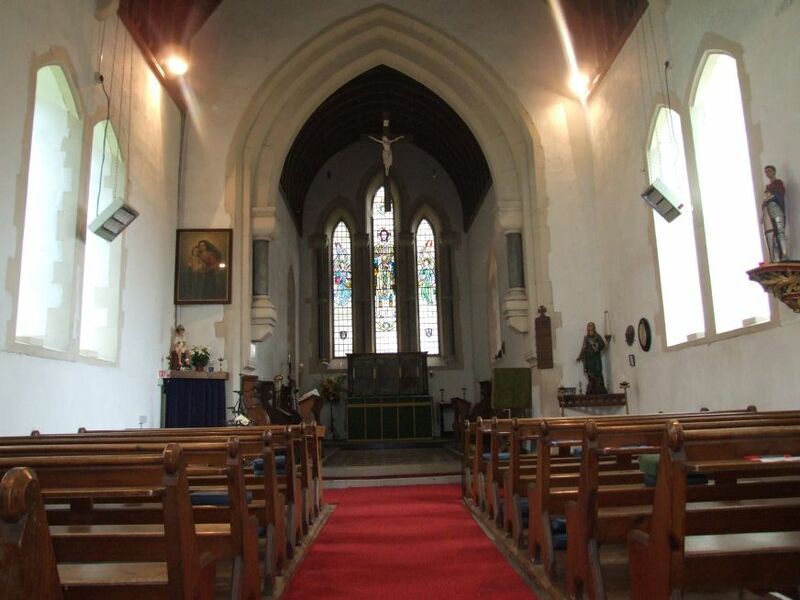 As I say, this is a remote, rural parish, and these days it is probably little visited. But Tatterford was once one of the stars in the Anglo-catholic firmament. This was a result of the work of the Parish Priest, Father William Hand, who started a school in Tatterford for boys seeking a vocation to the priesthood. Tatterford church was the focus for their liturgies, and from here the boys went to Mirfield Theological College to train for holy orders. Hundreds of boys from Tatterford went on to become Priests, many of them local north Norfolk boys. Father Hand's son, David, became the Bishop of Papua New Guinea. 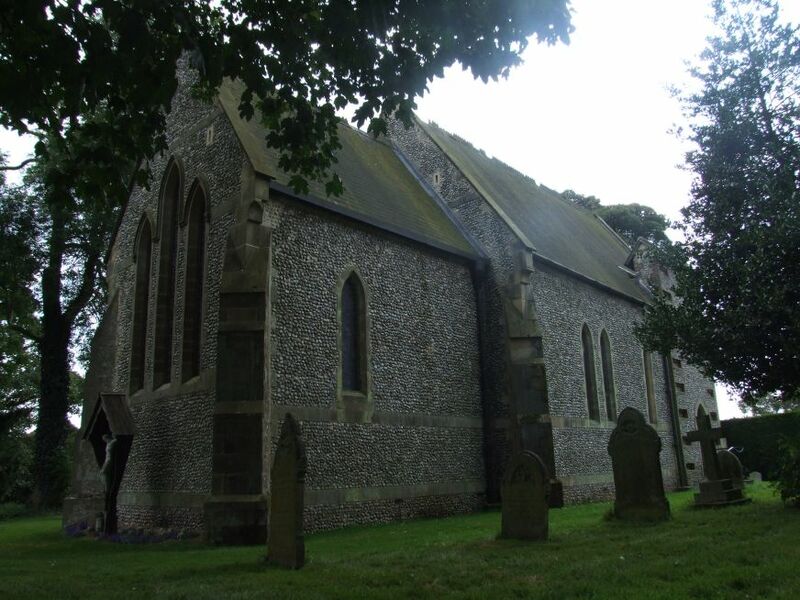 Because of its proximity to Walsingham, Tatterford was a popular stopping place for Anglo-catholic pilgrims, and on a summer evening there might be hundreds of people here for Benediction. Hard to imagine now. Again because of the Walsingham effect, the goings on at Tatterford were not approved of by the Bishop of Norwich. The school finally closed in the 1940s. This was not deeply regretted by the Diocese, and little remains to show that it was ever here. The crucifix at the top of the path once stood in front of the school, but that's about all. However, enough survives of the Anglo-catholic enthusiasms of those days to send a frisson through anyone coming here to find them. You step into a dark, devotional interior, and all around are statues from the days when this was virtually a shrine in its own right. St George, St Margaret, and something most unusual, an image of the young Christ teaching in the temple, are still on their brackets, and it is easy to imagine ranks of candles flickering in front of them. Father Hand particularly recruited young men who did not have the academic or social background necessary to go to University, and because of this I found the statue of the young Christ very poignant. How it must have spoken to them. The spiky, separatist Anglo-catholic movement is dying, and in any case the name Tatterford had long since ceased to register on its radar. At one point in the 1980s, the congregation here was down to just two people. 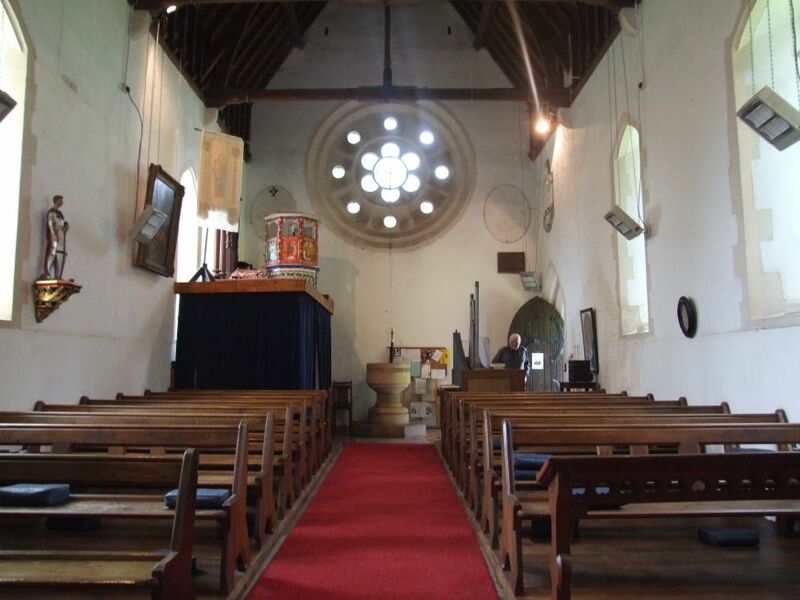 However, there has been a village revival of sorts, and this intensely devotional space is now in regular use again. There's no doubt that Tatterford is essential visting for anyone interested in Walsingham and the 20th century Anglo-catholic movement, but there is another good reason for coming here. Moira Forsyth's east window of 1947, depicting Christ the High Priest, is probably the best of its decade in the county.